The Pure Flix film “Unplanned” soared past producers’ expectations when it doubled its projected revenue on opening weekend. The Christian movie exposing light on the dark industry of abortion, namely Planned Parenthood, raked in an impressing $6.1 million dollars. Scheduled amidst a solid weekend movie line-up including “Five Feet Apart” and Disney’s “Dumbo,” “Unplanned” held its own amidst the secular films, in spite of hurdles to promote the movie along the way. Most major networks, including Hallmark, Lifetime, and HGTV refused to air commercials for the pro-life film, citing it as “too political.” In fact, Fox was the only big network that agreed to an ad contract. Another opposing factor for Pure Flix was that the movie got unexpectedly hit with an R-rating by the MPAA, which is typically a death sentence for a family film targeted at a Christian audience. But the numbers and reviews spoke for themselves despite the uphill battle against the powerful abortion conglomerate that is Planned Parenthood. On April 1, Abby Johnson — the Planned Parenthood director turned-pro-lifer who inspired the movie — celebrated another record-breaking moment in the film’s launch. “Look who we just passed in followers,” Johnson tweeted along with a smiley face. And this was one of the few social media statuses yesterday that wasn’t an April Fool’s joke. Along with the exciting news, the pro-life advocate posted a side-by-side screenshot reflecting that the @UnplannedMovie had racked up 266.8K followers, surpassing Planned Parenthood’s 255.7K. And that number is rapidly growing. Only a day later, Unplanned has amassed 327K followers. 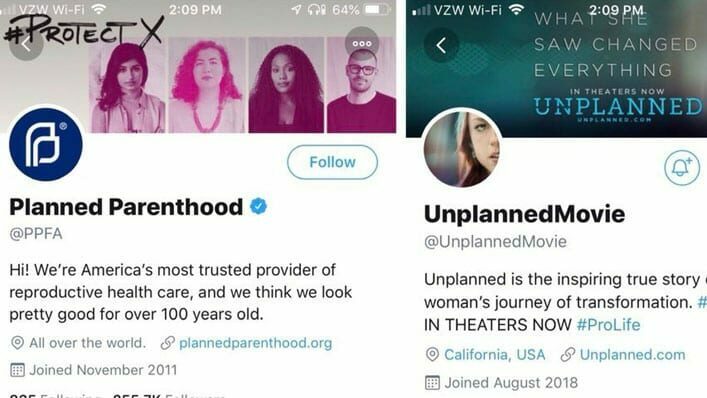 Planned Parenthood’s Twitter account was launched in November 2011, while the “Unplanned” account was only started last August by comparison. The massive influx of followers follows a major wave of complaints from pro-lifers on Sunday who attempted to follow the film on Twitter but were instantly booted off. Many complained they were showing as “unfollowed” after attempting to “follow” multiple times. One disgruntled user remarked that the number of followers had dropped from 200K to under 9K followers in only minutes. “Very shady Twitter!” she commented. 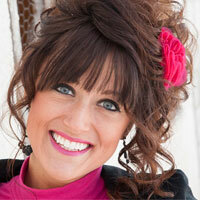 The issues surfaced soon after Johnson made a big announcement on Twitter about informing new fans of her ministry. With all of my new followers, I thought I would make an intro for my ministry, @ATTWNministry. We get abortion workers out of abortion clinics, get them new jobs, on a path to healing and then SHUT DOWN their former clinics. More info at https://t.co/8zoJ0MoOdy. About two hours later, Johnson noticed “Unplanned” lost nearly all of its followers. She posted screenshots showing the account dropped from over 100K followers to only 261. “What’s going on @jack?” she tweeted, directly calling out Twitter CEO Jack Dorsey. In spite of the many obstacles running against it, “Unplanned” has continued to defy odds and attract a loyal followership dedicated to its mission of ending abortion for good.